Although we are approaching Halloween, this pool is nothing to be scared of! 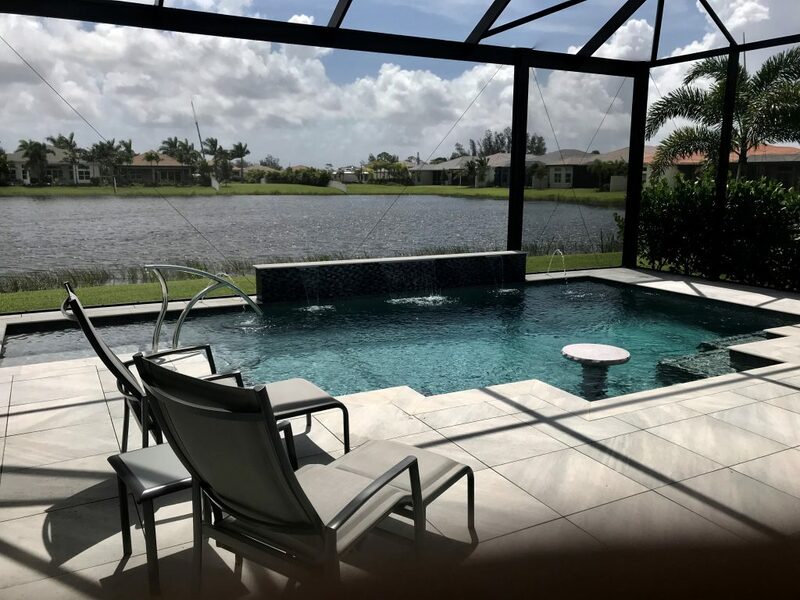 In fact, we are so in love with this completed job located in Valencia Bay, a new development in Boynton Beach, that we couldn’t wait to share some info on what makes it so unique. First off, this swimming pool was created within a smaller space, but our team was still able to encompass everything the owner desired. The backyard also sits nicely on a lake, offering stunning views. The first thing you may notice is the custom railing. This really elevates the look of the pool, along with some unique water features. There are waterfalls from the elevated deck area along with fountains located on each side. There is also a seating area built right into the swimming pool! This area is amazing for entertaining or just enjoying some quality time if your pool. There is a bench built in surrounding the elevated table, which provides quite a bit of convenience for those looking to enjoy a beverage while cooling off in your pool. To finish off this incredible design, the pool showcases some gorgeous porcelain tile and a marble deck. Some gorgeous deck furniture and a screen room are the last touches and now it’s ready to enjoy all year-round! To find out how Treasure Pools can create your ideal swimming pool, give us a call today or stop by our showroom to see for yourself.